Bodrum is the ideal starting point for sailing the Aegean coast of Turkey. The Gökova Gulf is acknowledged to be one of the best cruising areas in Europe. With abundant sunshine, crystal clear waters, continuous blue skies, good anchorages and friendly people, this coast offers many diversities. There are many unspoiled areas rich in natural beauty and in costal settlements and villages. It is still possible to observe local people going about their lives in traditional Turkish village fashion. Archaeological ruins and historic sites abound in Turkey's southern coastal regions. Many ruins and sites such as Cleopatra's lsland, Knidos, Caunos, Patara and Kekova can be visited only from the sea. Others such as Ephesus, Dydima, Miletos can easily be reached from anchorage points. A gullet is a yacht typically of pine wood and styled with pointed fore and round raft. Traditionally, they have been built in Bodrum area of Turkey and hence are of referred to as "Bodrum-Type" yachts or "Gullets", sometimes also referred to as "caiques". Each one is equipped with one or two masts. They have superior sea going quality are very comfortable offering large living areas, wide sun decks spacious cabins, WC- Shower, and an aft deck with cushioned lounge area. Despite other intentions, a lot of people seem to spend most of their time sipping their drinks already on the sun deck. But for the energetic, we would recommend water-skiing, skin diving, fishing and walking in the woods when your yacht is on anchor in one of many fabulous coves. The Blue Voyage offers the best possible escape on the water: a means of forgetting the rigors of everyday life for a while and just letting go of time. On a week or two week cruise, travellers sail along the Southwest Turkish coast, through crystal clear waters frequented by schools of dolphins and into quiet bays, the harbors of small, picturesque villages and many a historic port. Wherever you may come from, and however old you may be, after a week or two afloat in this scenic wonderland, you will become of one heart with the beauty and serenity of nature. Both body and mind will revel in this healthy, happy environment. For the type of Blue Voyage we offer, you don’t have to hold a skipper’s license, nor do you need to be an avid sailor. Many companies provide you with a traditional wooden yacht which you charter with crew. If you cannot get a group together so as to take your own yacht, you still have the opportunity to join one of the weekly cabin charter cruises. 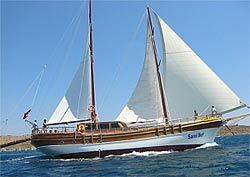 Most of the yachts are of the traditional wooden variety, built either in Bodrum, Marmaris or Bozburun. During the day, you cruise for a few hours and sail if the wind allows. Closer to lunch or dinner, the captain drops anchor in a solitary bay, alongside a small village or off an island. At every stop, and there will be at least two per day, there is the opportunity to swim, fish, snorkel, windsurf, sunbathe, take a trip ashore or just read under the shade of the sun awning. The accent is on relaxation and recreation. Your friendly, attentive crew will consist of a captain, a cook and either one or two seamen. Their job is to ensure that you are comfortable, well fed and entertained. Provided they are accompanied by adults, children of any age are welcome to come along and will positively thrive in the warm waters of the Turkish Aegean and Mediterranean. The guests are advised that they will be spending most of their time in a bathing suit so it is a good idea to bring at least two! For land trips, a pair of long, light trousers and a shirt are advisable. Evenings may be cool, certainly during the earlier and later months of the year, so you are best to bring a pullover and a windbreaker. We also suggest you pack your beach towel, plenty of suncream, snorkels/flippers/goggles if you plan on doing lots of snorkeling and a sleeping bag if you are planning to sleep on deck (which most of the guests do). Bed linen and towels for use in the cabins are provided. Your Turkish crew may not have a thorough knowledge of English, so you might be advised to take a small traveller’s dictionary along with you for the cruise. Besides being understood more easily, it is also a great way of picking up a few words of Turkish. We suggest you bring your belongings in a collapsible bag, rather than a suitcase, as bags are much easier to stow away, and also serve to limit how much you pack! You may like to bring a light day pack for excursions ashore. One final word of advice: normal street shoes are definitely not acceptable on board a yacht... we suggest you to bring soft-soled shoes for getting around on deck.